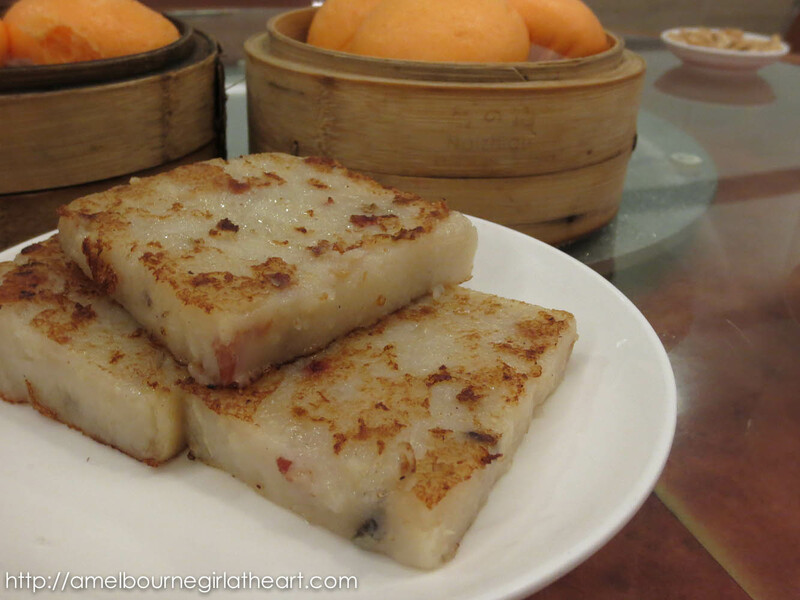 Melbourne is definitely spoilt when it comes to dumplings. Being out of the foodie-loop for a while means that I wasn’t even aware that another dumpling joint had opened up a number of weeks ago until Libby suggested ShanDong Mama as a post-work catch/meet-up spot with Winston and Dave. Poor Daisy was sick so couldn’t make it but there will be next times I’m sure ;). After walking in the wrong direction (it happens), I found a guy who I assumed was theragingcook aka Dave. After confirming his identity (lol), we headed in to peruse the menus as the others were running a bit late. No photos of the drinks but you should definitely check out Dave’s 8 Treasure Tea – very pretty but a bit too hot on a warm summer night! Libby soon arrived and helped out with the orders. It’s always nice to eat out with fellow foodies coz we’re all on the same wave length about trying a bit of everything :). None of us had really done our research but we knew dumplings were a must! It did seem appropriate to have at least one dish of a different variety though. We decided to try the noodles with shredded port, egg and seasonal vegetables in sesame sauce. SG Day 1.1 can be found here. After receiving my first ever manicure and pedicure (that’s what holidays are for, no? 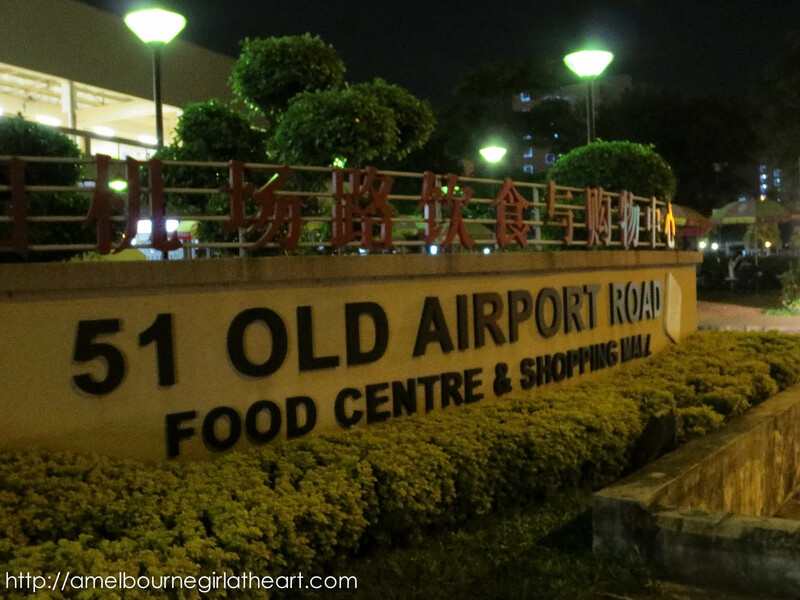 ), we took a taxi to the hawker centre on Old Airport Road. 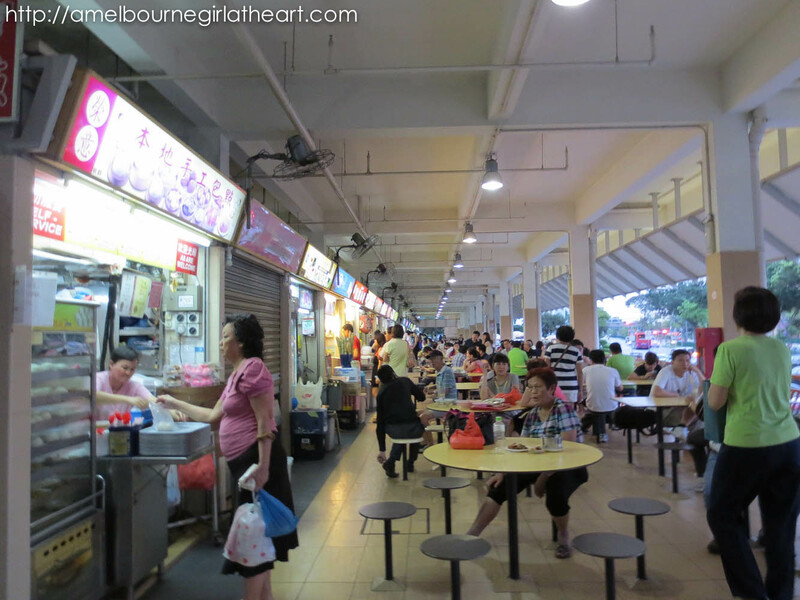 For the first-time traveller to Singapore, hawker centres are a must! 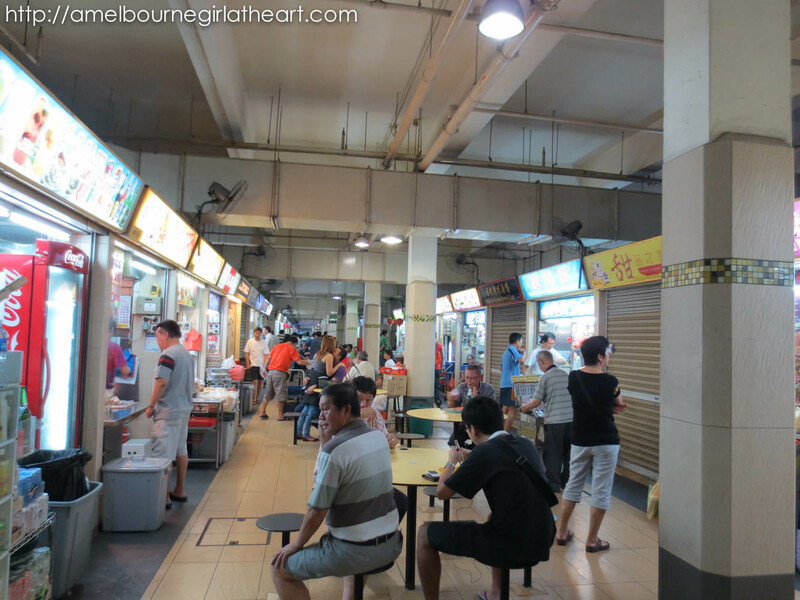 Set up in a food court type setting, you’ll soon discover (as I did) the delicious local dishes of the country and for a fraction of the price of any meal you’d get back in Australia – and more tasty too! 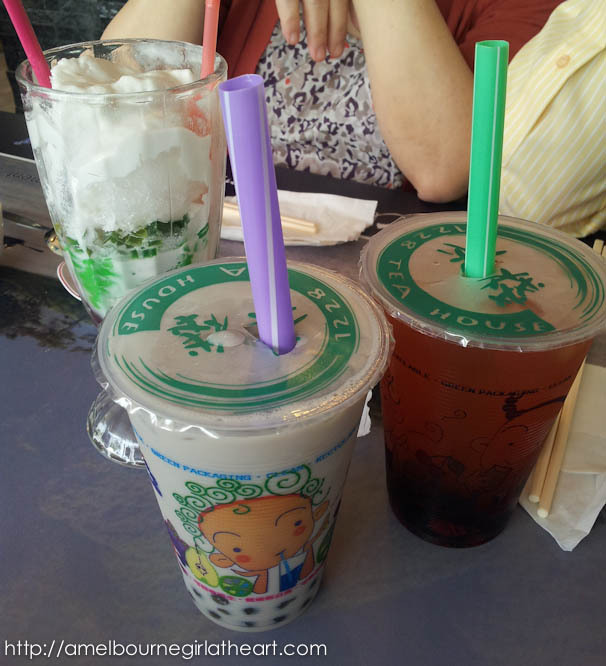 …before she sat me down to order some sugarcane drinks and she went off to put down a few more orders! 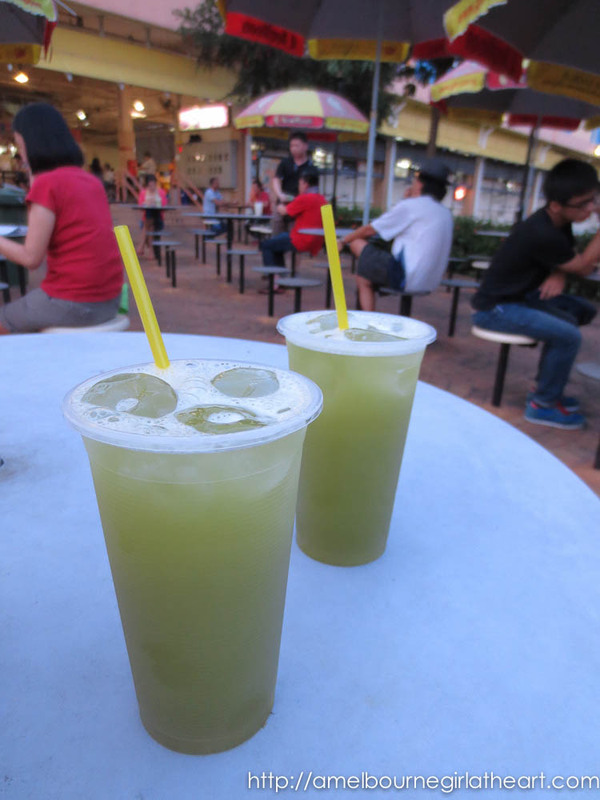 These sugarcane drinks were so refreshing and of course very cheap too (though I cannot for the life of me remember the price – they don’t give out receipts haha). I was also fascinated about how there are people who wander around with a money pouch; you tell them what you want to order, pay them, and then they bring it back! 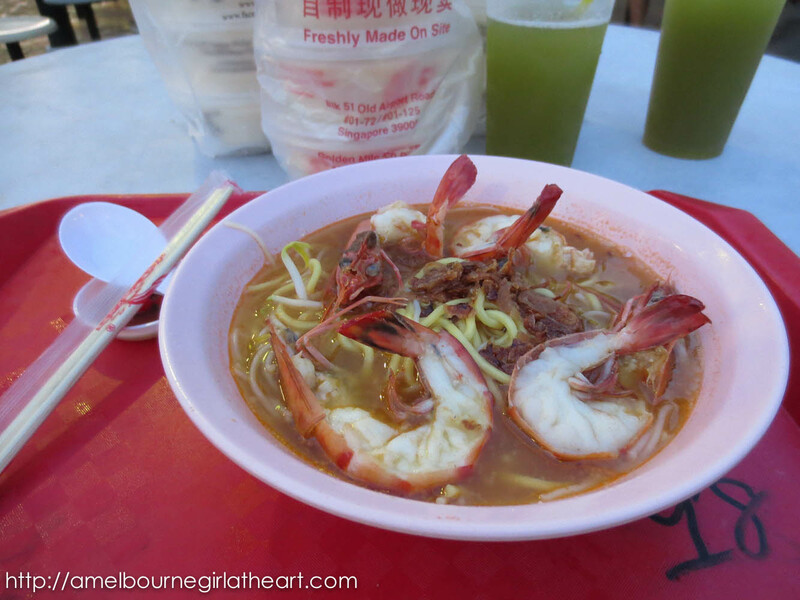 Now that I think about it, I guess it’s just like a waiter in a restaurant but in an open-air context, it seemed really novel for me :P.
Prawn Mee: SO GOOD! 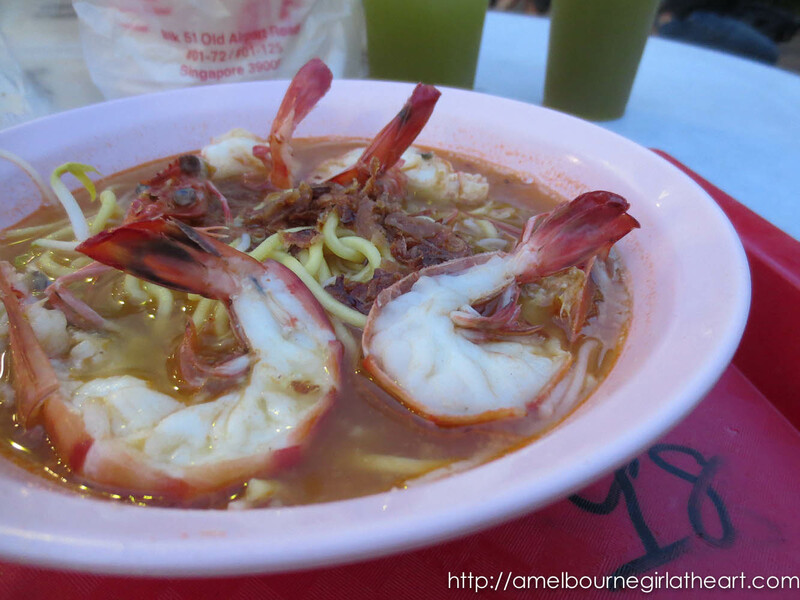 I liked how they cut the prawns in half – made it much easier to eat. Soup was full of flavour and noodles cooked just right! Wonton and Char Siu Mee: Loved it. I think I am more of a dry noodles kinda fan so this suited me well :). Wontons were a lot smaller than we get in restaurants back in Melbourne but I’ve been told that this is how they used to make it traditionally. 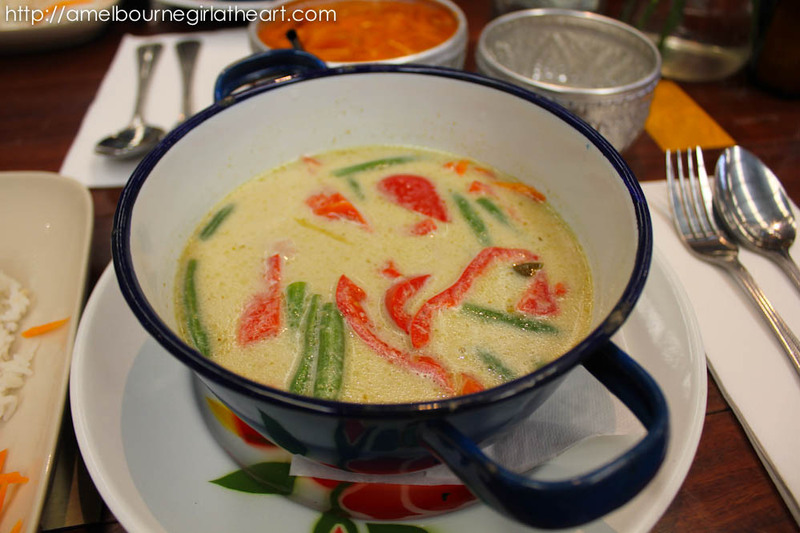 I didn’t drink much of the soup – MSG concern lol. And what added to the awesomeness factor was how unbelievable CHEAP this all was! 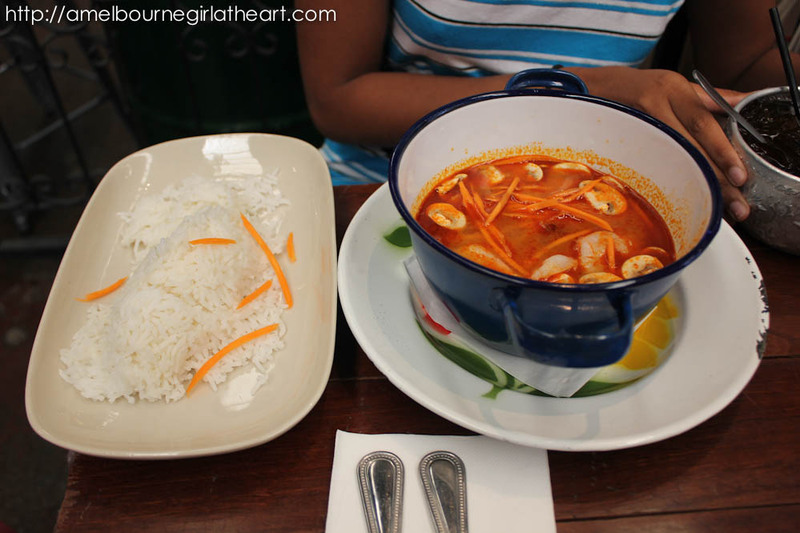 Easily under $10 AUS per head and we were feeling very full afterwards. Oh and what became of the soya bean curd? 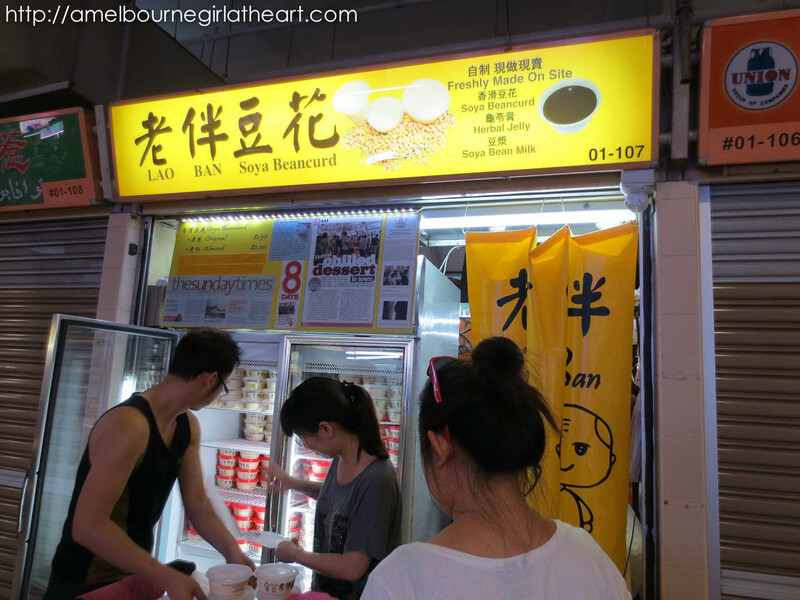 Apparently the soya bean curd from Lao Ban and 51 Soya Bean are slightly different in taste but it wasn’t as obvious to me so if you get a chance try both :D.
…liquid gold!! :D Now this is something that definitely hasn’t made it over to Aust in its traditional form. 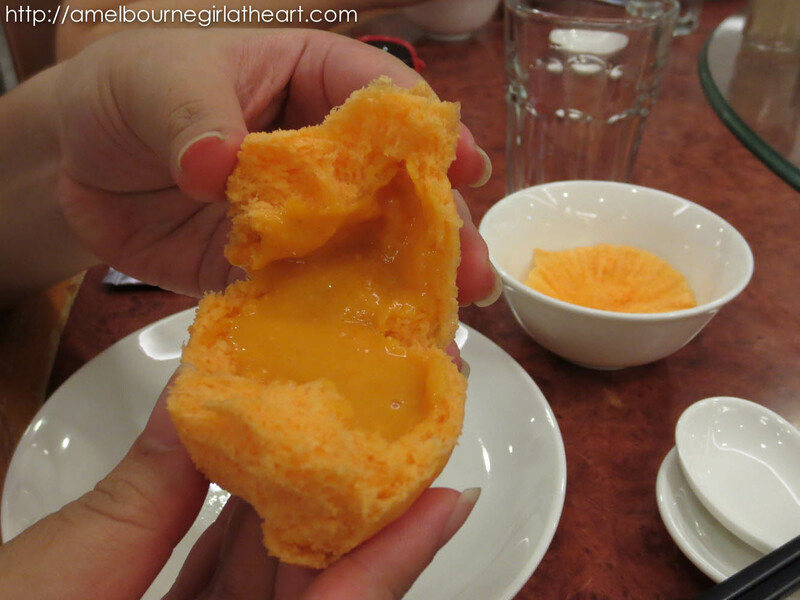 The colour isn’t as evident against the orange casing but tasted SO GOOD *happy sigh*. Was a lovely end to Day 1 in SG :). *Disclaimer: All food reviews are purely based on my own experiences and how I feel about the service, food and quality at the time of visit. I am merely a lover of food and by no means a food expert! 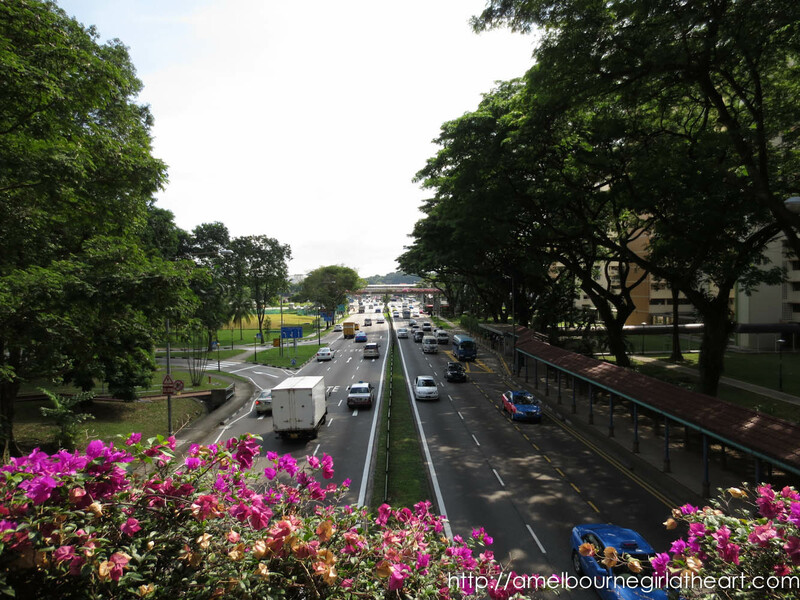 Coming up: More hawker centres and the first of my hipster café visits :P.
Shall we begin with a vlog? 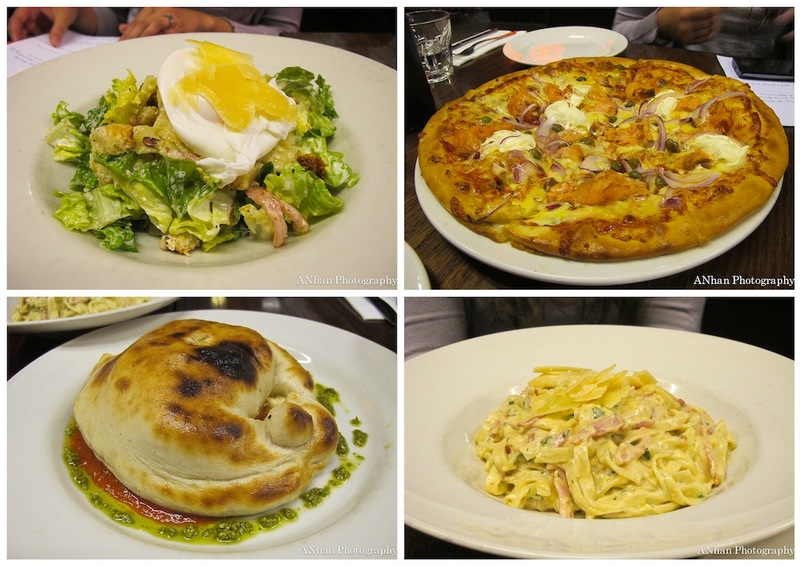 Please skip if you’d rather avoid randomness and just get on with the food :D.
Note: Cost of food noted is in SG Dollars. 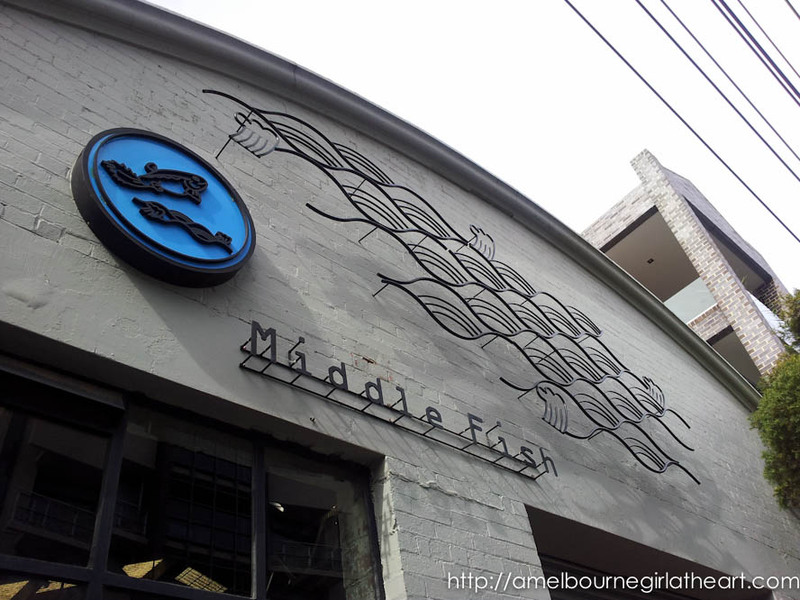 My friend, May, pronounced Koi Café much better than any place we had in Melbourne so I decided to give it a go. 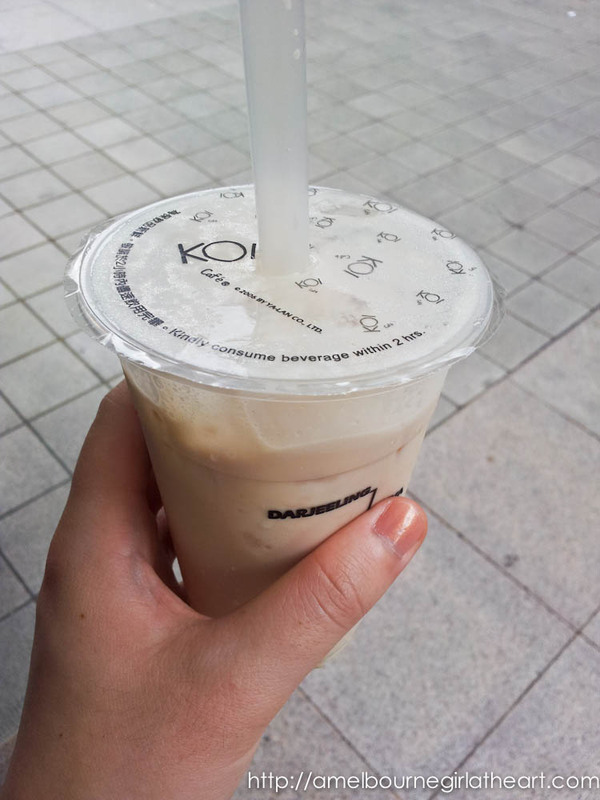 Ange suggested I get the original milk tea with the addition of ice-cream – hard to go wrong when there’s ice-cream involved lol! 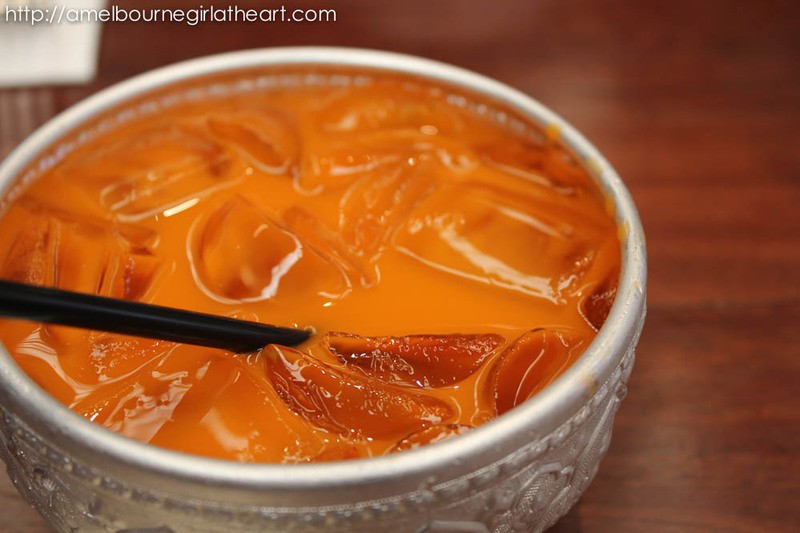 Given that I wasn’t quite used to the humidity of SG, this drink was a cool relief as we continued the search for an elusive pre-paid sim card (each stall we tried seemed to be sold out!). Once we got that sorted, it was time for lunch! 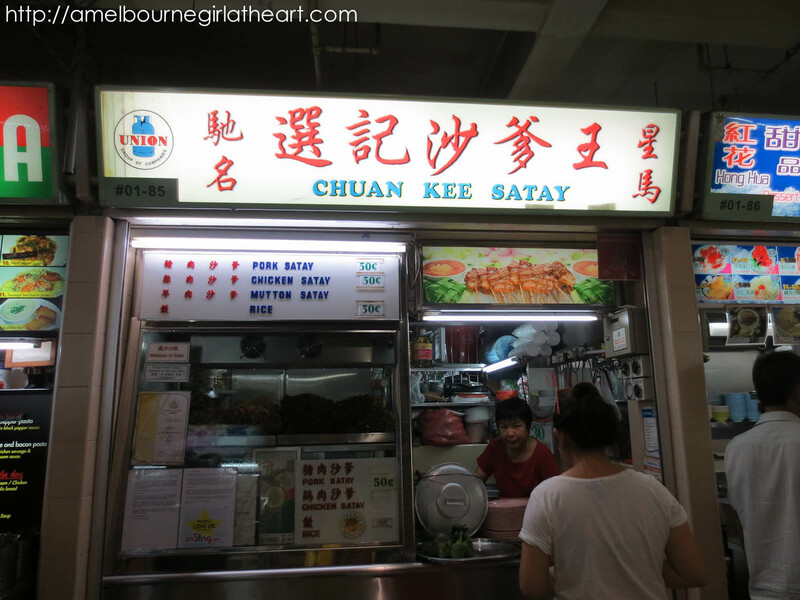 On the flight from Melb – Darwin, I sat between two lovely girls who were on their way to SG too and when I asked them for food suggestions, they both said to try Boon Tong Kee’s famous chicken rice! 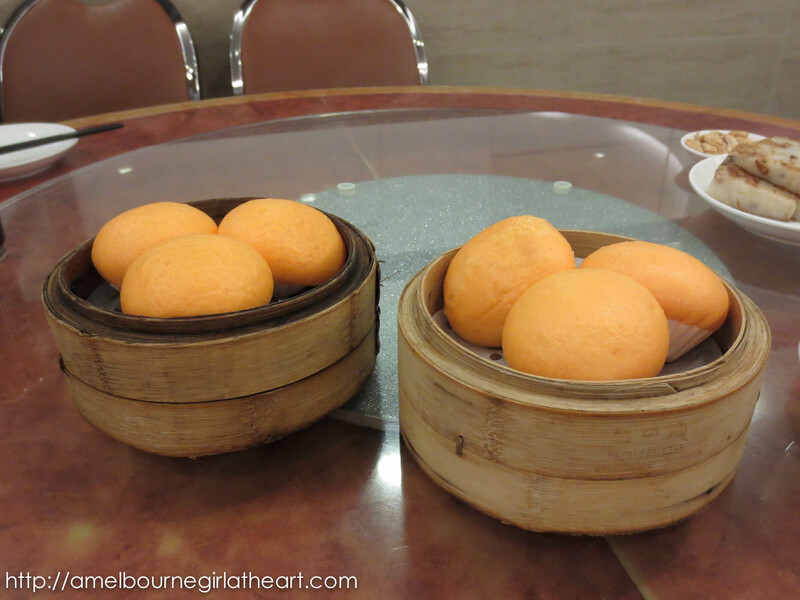 Ange hadn’t tried it before but that became our first proper food destination of Day 1! 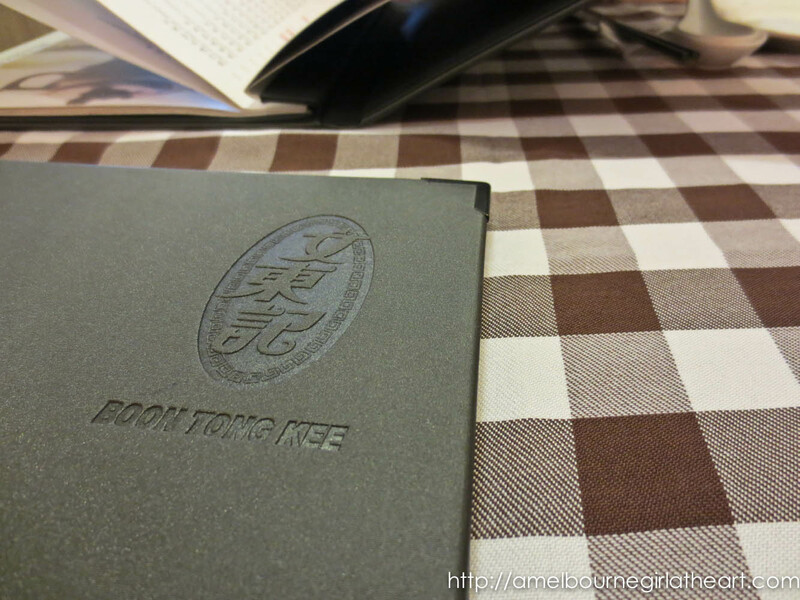 The menu was good because it had pictures haha (sorry, didn’t take any photos of the inside of the menu!). 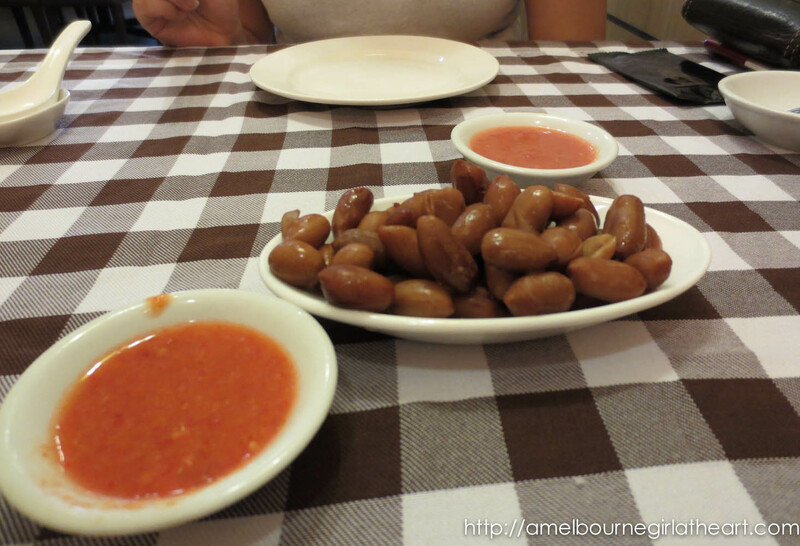 Once we’d placed our order, we were given a plate of salted peanuts to munch on in the meantime. 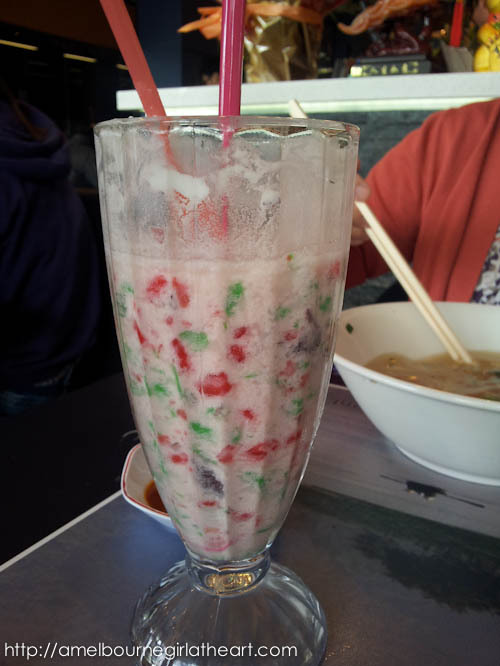 They were alright but unfortunately, Ange’s suspicions were confirmed – these were not for free lol ($2.00). Our tummies were rumbling since we had not eaten breakfast that morning so we were delighted when the main dishes finally made it to the table! This probably wasn’t the best angle to take the photo of the chicken from but let me tell you we were very ready to stuff our faces haha. Ten points for presentation (loved the addition of the purple orchid) but sadly, it rated a bit less in the taste department. Maybe it was because our expectations had been too high, but I personally felt that the chicken was a bit bland for my liking and didn’t seem quite worth the $10.00 we paid for it. Perhaps the issue was that we should have chosen not just the chicken but with the special rice cooked in chicken stock that goes with it as well? 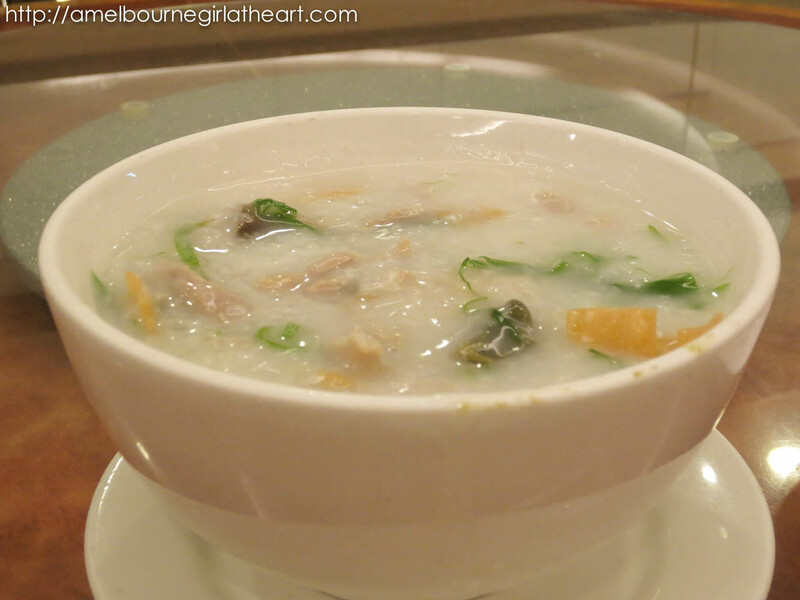 I felt that the chicken rice I had at Changi airport on the way back seemed much better and value for money ($5.00!) in comparison. We decided to get some vegies to go with the chicken and I have to say that this dish actually outshone the main event. 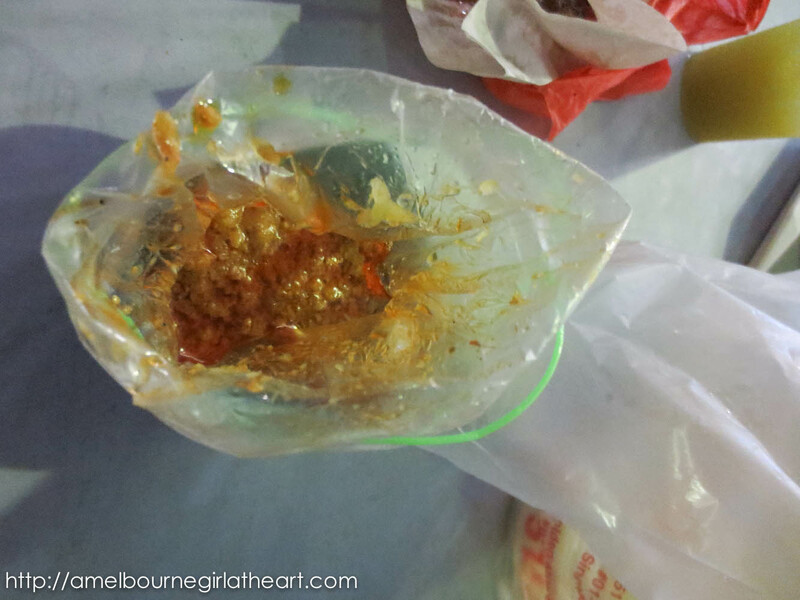 Where the chicken lacked flavour, the stuffed beancurd and eggplant ($18.00) packed the punch. This was by far the better dish of the day for me. 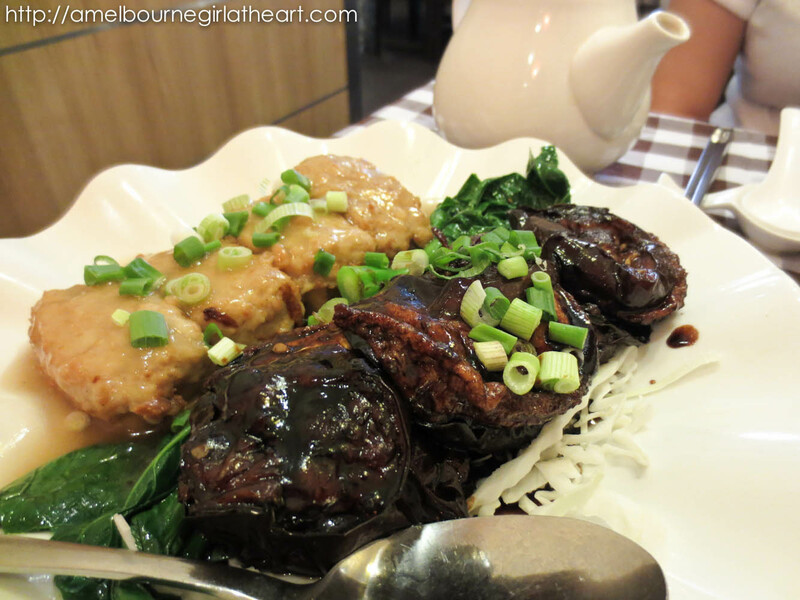 I loved the sauce that they used and eggplant is a favourite for me, no matter how it is cooked :P.
We also had plain rice to go with the dishes (50 cents each) and Ange had a barley drink ($2.00) and I had a chinese tea ($1.50) to go with it. Damage done including taxes was $40.30 SG which is currently about $32.57 AUD. Not too bad but not as cheap as some of the other places we went to afterwards. 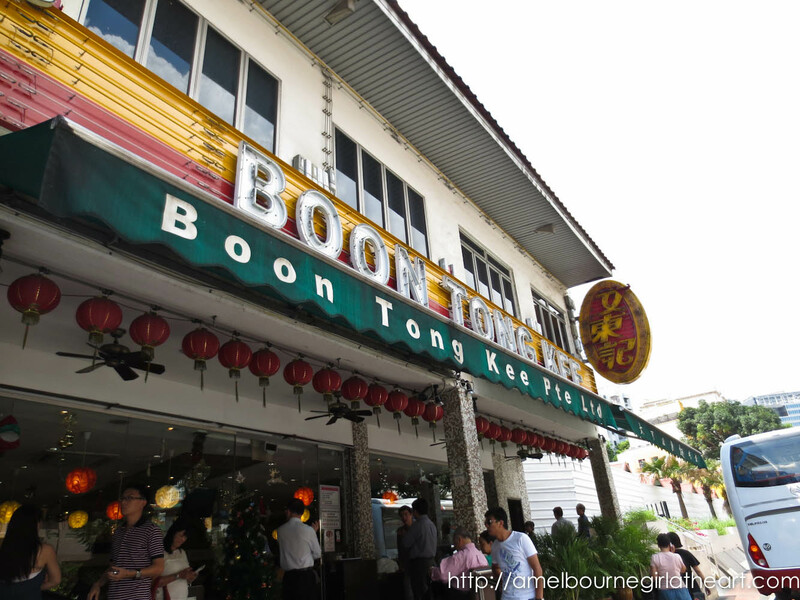 Having now looked at their website, I think I would visit Boon Tong Kee again next time I’m in SG and either order a chicken rice combo set (take away) or try one of their other recommended dishes. 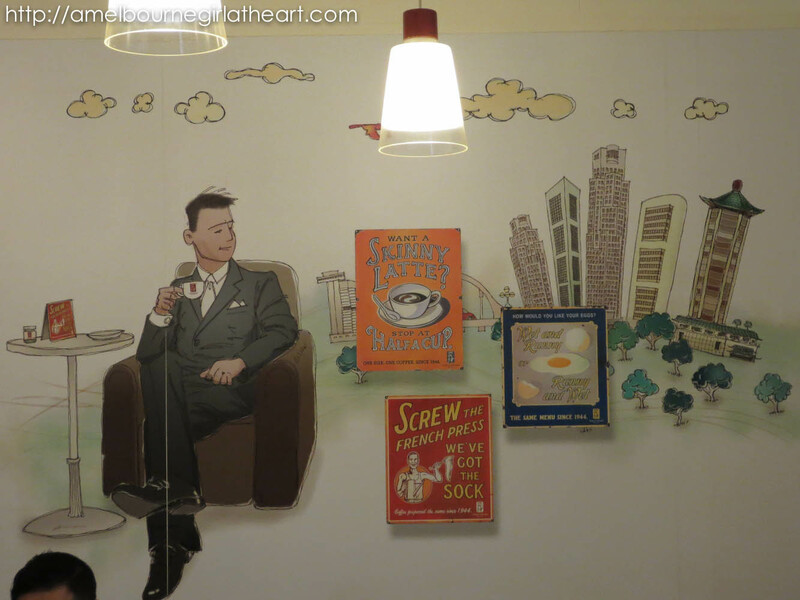 See ladyironchef (a pretty prolific and well-known SG food blogger) for further thoughts on Boon Tong Kee’s chicken rice. Moving on after lunch, I was introduced to Orchard Road and we did a bit retail therapy. We must have done a fair amount of walking around as soon it was for afternoon tea :P.
Kaya toast was on the list of to-eats so having seen Ya Kun Kaya Toast almost everywhere, this seemed like a good choice. 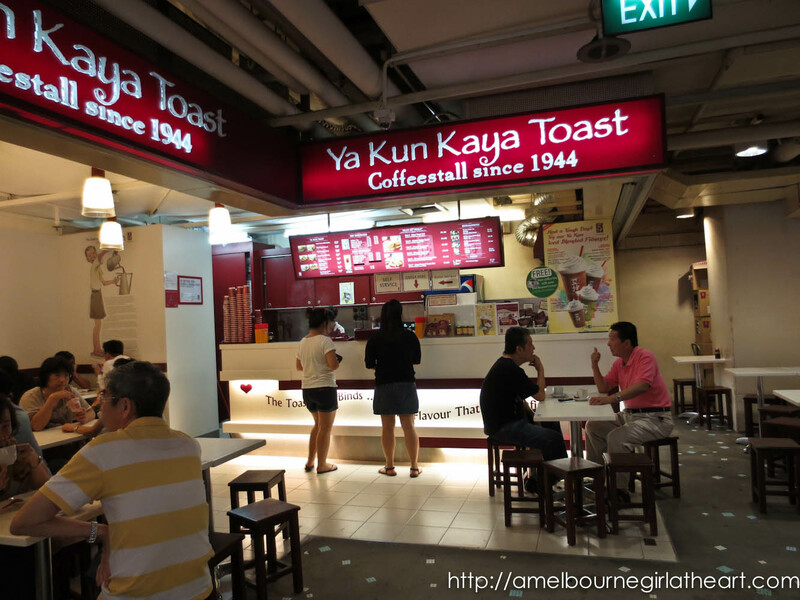 Established in the 1940s, Ya Kun Kaya Toast has developed a reputation for “unparalleled kaya toast and irresistibly fragrant coffee and tea, enjoyed amidst a cosy atmosphere.” – from their website. We went for a kaya toast set each consisting of kaya toast, soft boiled eggs and a beverage of our choice. What was most interesting for me was how thin and brown the toast was! 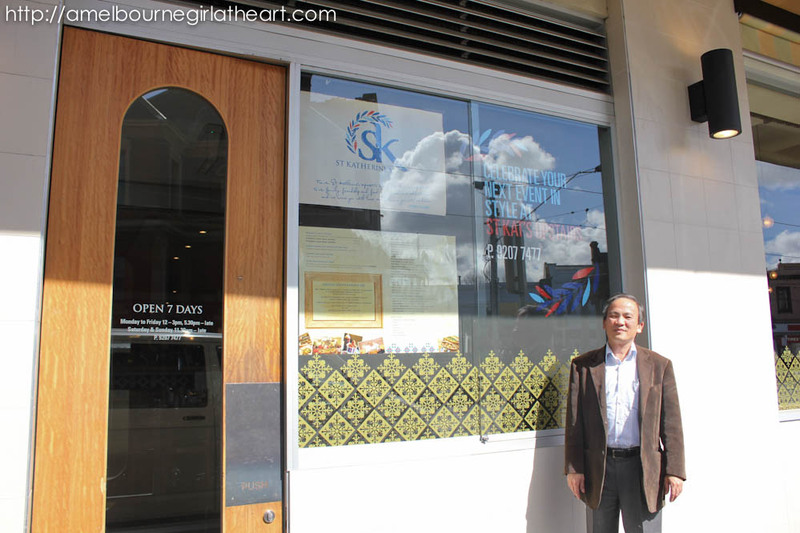 Since Killiney Kopitiam opened on Lygon St earlier this year, I’ve had their kaya toast at least twice (cheap cheap!) and it looked nothing like this! Also, I liked how they only had two thin slice of butter between the bread – I always feel slightly grossed out biting into the block of butter that Killiney put on their kaya toast. Didn’t take notes for exact prices but it was pretty cheap from recollection. Definitely a good place to stop by if you are after something to carry you over until the next main meal :). And we made it halfway through Day 1, hooray! :D Three things ticked off the list! 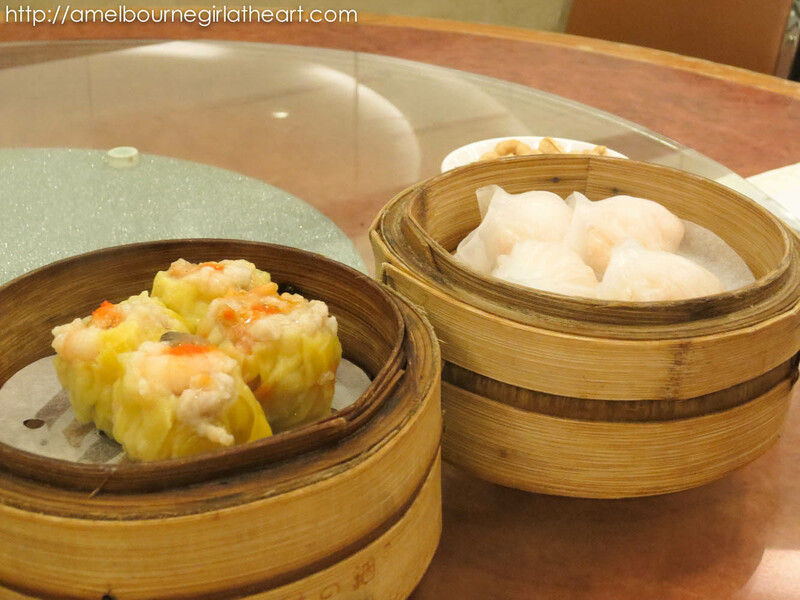 Coming up: dinner and supper on Day 1 – hawker food and dim sum… mmm. 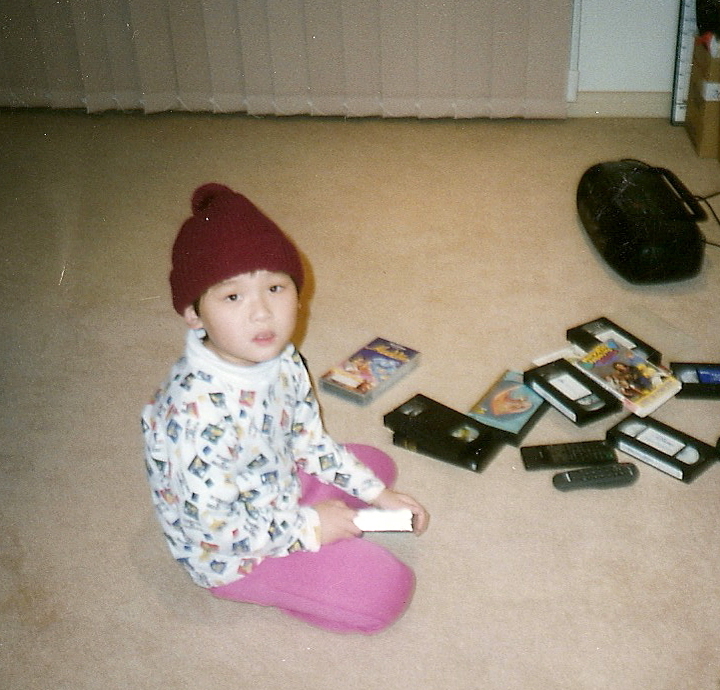 Question from vlog: What was your favourite (or perhaps most memorable) gift/moment of this past Christmas season? I’ve been contemplating whether or not to write this particular review because frankly, no one likes to be told that they’ve missed the mark, right? But at the same time, if you don’t say anything, how will they know to improve? 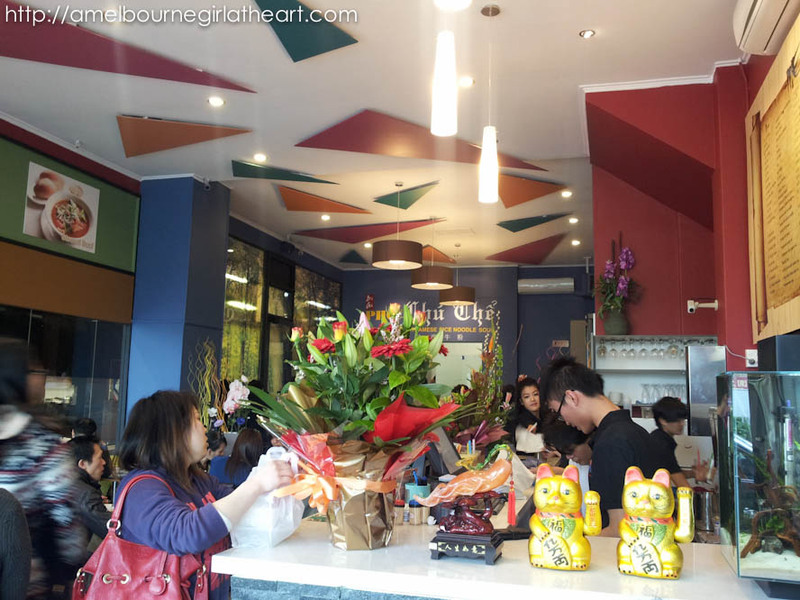 So, it’s with a bit of reluctance that I share my first experience at the new Viet place in Box Hill, Pho Chu The. 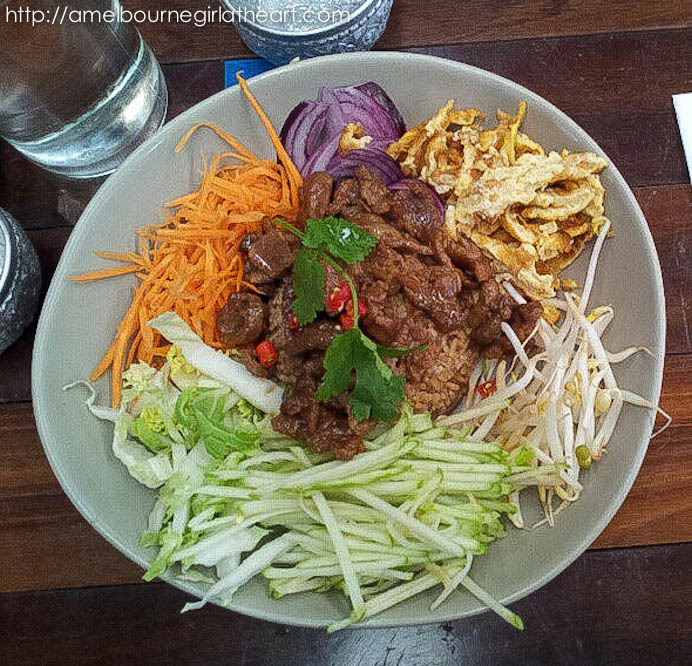 With my mum’s workplace located in Box Hill, we often lunch there and are quite familiar with the food options available in the area. So when the news spread like wildfire (as it does in an office setting – an email does the trick) that a new player was in town, it was inevitable that my parents and I would find ourselves outside Pho Chu The on their opening day. There are two views when it comes to visiting a new restaurant – They should either have their best game face on to make a good first impression on opening day OR they haven’t yet got a chance to try things out properly so you should give them a bit more time to settle in. 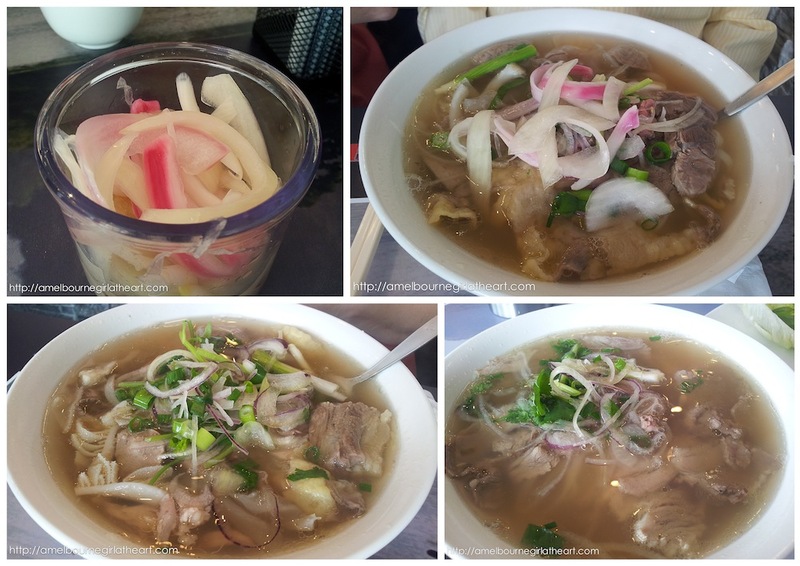 For Pho Chu The, it came out the second way. There was a bit of a wait as we came at the peak lunch hour, but once tables were cleared we found a spot in the front corner. Taking over from the Old Tea House Restaurant, the ceiling was high with lots of natural light filling the space. Medium-sized LCD TV screens were installed though not functioning when we were there for lunch. However, I imagine there’ll be Asian dramas or TV shows showing in the future ;). Tables were finished with different scenes from the Vietnamese landscape which I thought was a nice touch. 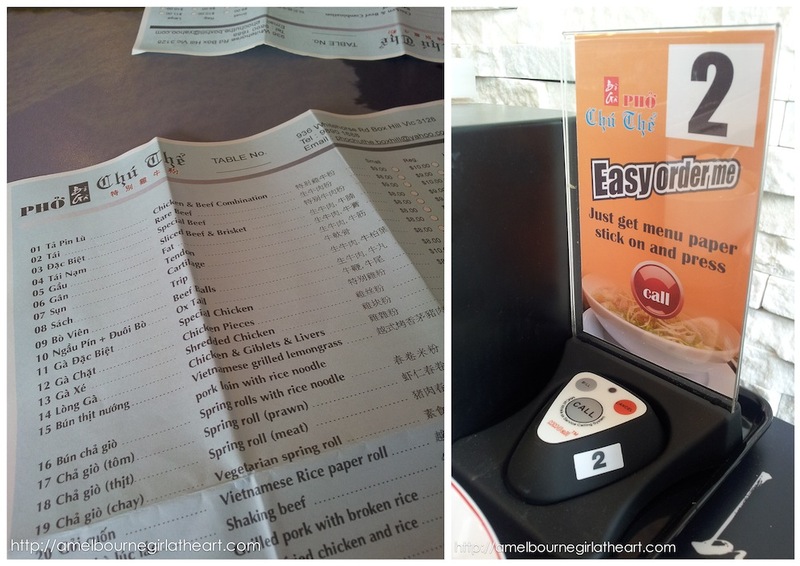 As is the trend with the new generation of Asian restaurants, you write up your own order and when you are done, you just press the pager and a staff member comes to collect it. I guess it’s efficient and given that Asian restaurants aren’t known for their great customer service, it probably helps that bit along too. Unfortunately, that’s pretty much where the positives end. Being at a Vietnamese church for 22 years that had monthly potluck with food after the service every other week, we’ve become quite critical when it comes to authentic Vietnamese food. 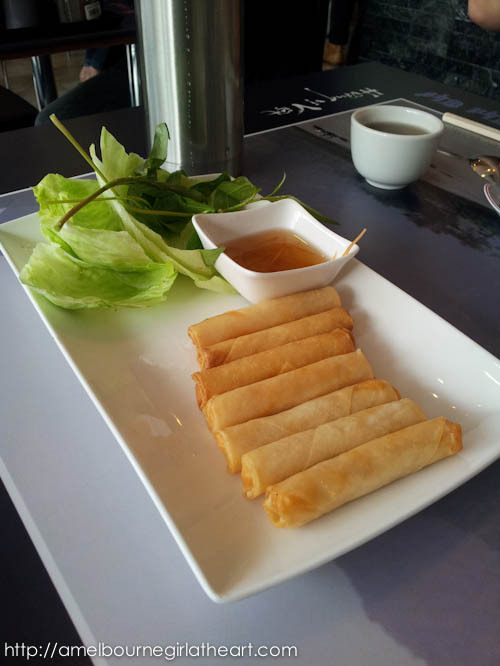 We started off with a serving of Cha Gio (tom) – Prawn Spring Rolls ($8.50) which weren’t hot enough. It made me think that they had been deep-fried a while ago and they just reheated them before putting it on the plate. Though definitely ‘prawny’, it just wasn’t good enough by our standards. Sadly, the phở didn’t measure up either. The phở wasn’t hot enough, and the broth in general didn’t have a strong flavour = it hadn’t been cooked for long enough. While there for lunch, my dad saw a friend who works as a butcher and went over and asked what he thought of the food. 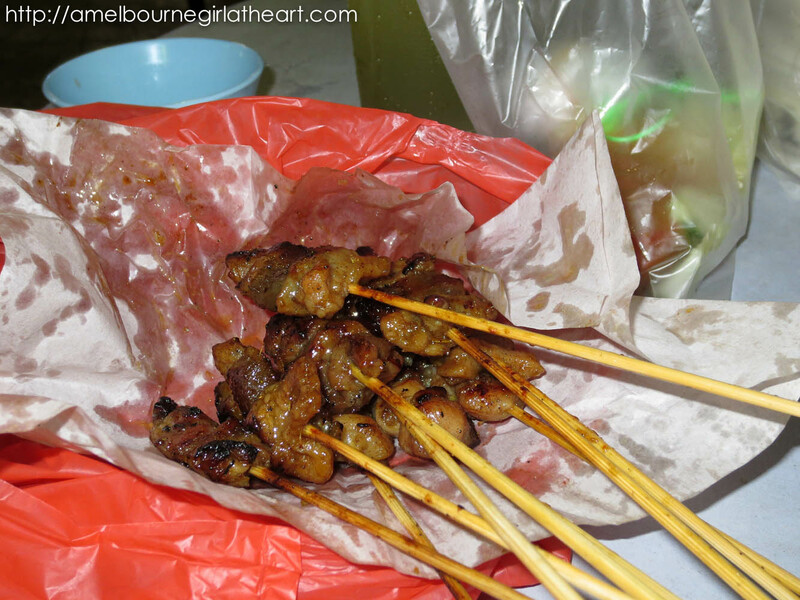 He said that their meat wasn’t very good quality and was probably from an ‘older cow’ as opposed to a ‘younger cow’ that is more tender (lol, it sounds much less blunt in Viet I swear!). 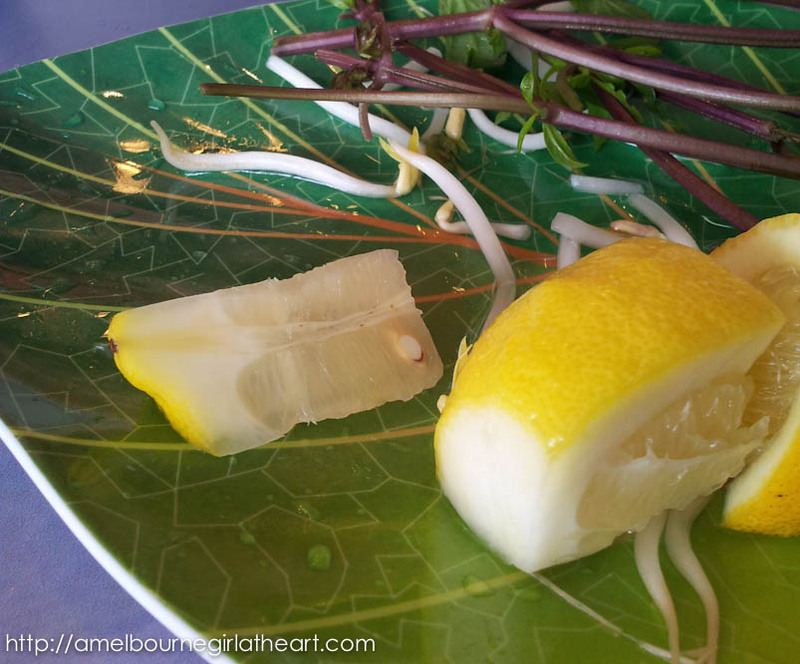 I liked the onion condiments though – probably the only thing I remembered about the meal. 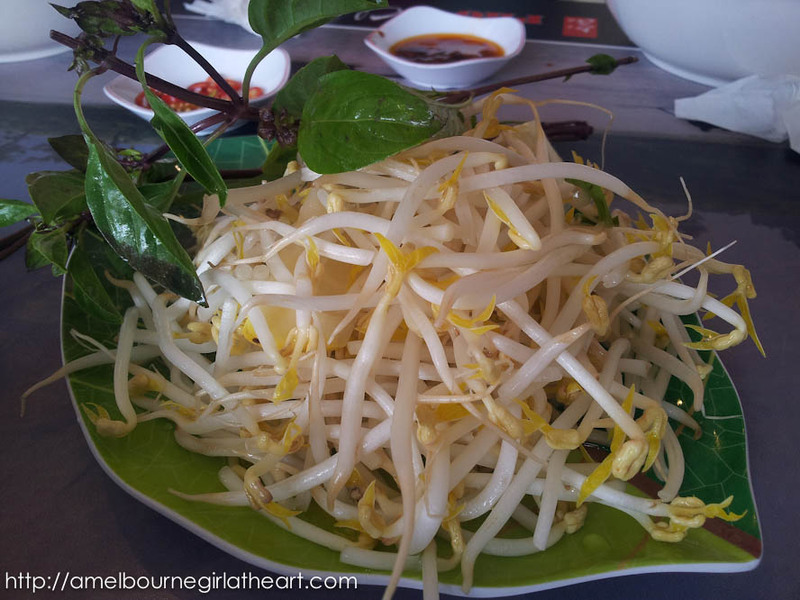 I know the staff were still finding their feet but it doesn’t look really good when you need to make a request (after the phở had arrived) for the plate of bean sprouts and mint that generally accompany the phở. And what is this?? How is one supposed to squeeze the juice out of this?? lol, I was just dumbfounded. 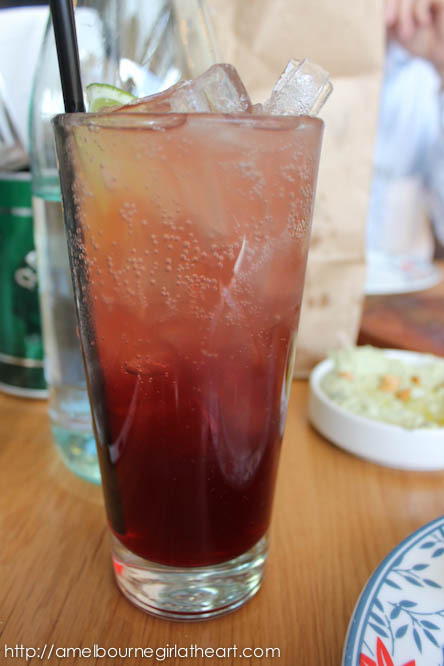 The cream didn’t mix well with the other parts of the drink and I think they forgot to add the sugar syrup as it was very bland = mostly left untouched in the glass :(. 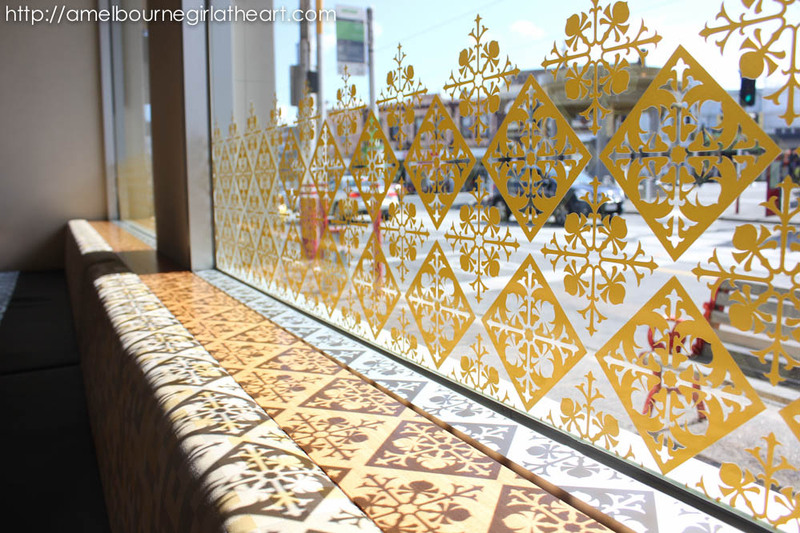 We really wanted to like Pho Chu The, given the reputations of the Footscray and Richmond stores of the same name. However, there’s much room for improvement. The staff seemed a bit flustered, not really knowing the ropes yet and getting orders confused but I think (and hope) that with a bit of time, things will pick up here. We did find them a bit pricey for the quality of food that was produced but 20% off the bill (for the first 2 opening weeks – from 19th September) made it a bit more bearable. *sigh* It’s not nice writing a bad review but I must stress that this was their opening day! They were open from 9am that morning so perhaps with the lack of experience, the quality had dropped over the few hours… My dad has said that he won’t go back unless there is an improvement so I hope that when we revisit, they’ll have ironed out the creases and I’ll be able to report back with more favourable comments. Hope you can visit and make your own assessments. 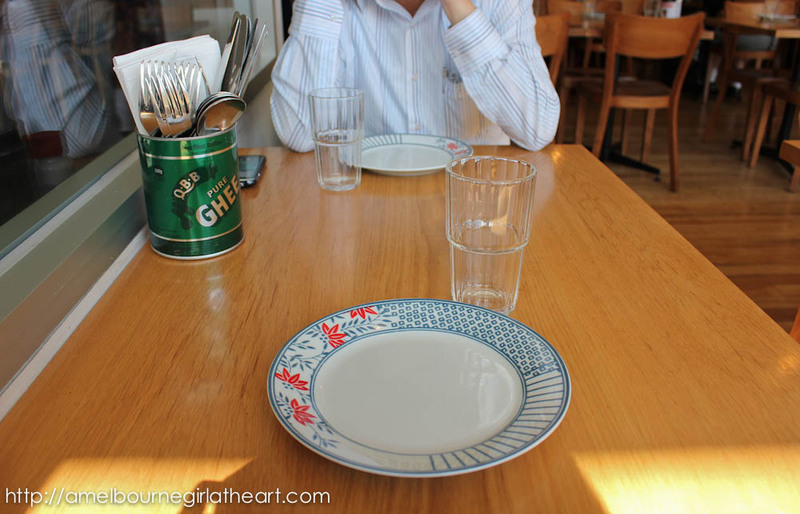 Question: Do you think you should visit on a restaurant’s opening day or is it wiser to give them a bit more time before visiting? P.S. 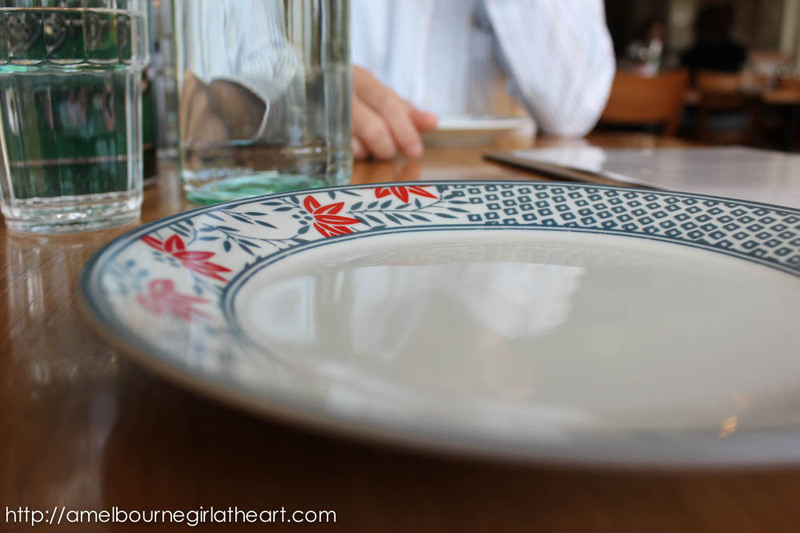 Don’t forget to enter the Royal Melbourne Show giveaway! One more night before the winner is announced :). Edit 24 Sept: Giveaway has ended now. We interrupt our usual blogging cycle for a very special post to celebrate Father’s Day! For our international visitors: Yes, we Aussies celebrate Father’s Day on the first Sunday of September – the way it has always been ;). 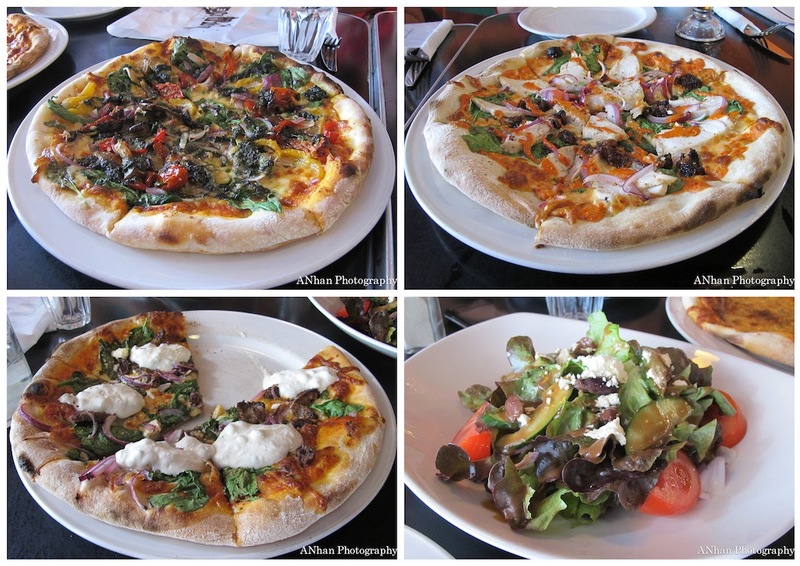 As Father’s Day weekend is usually quite busy for our family (yes, this has been published by the wonders of scheduled posting), I decided to take my Dad out for lunch last Friday :). 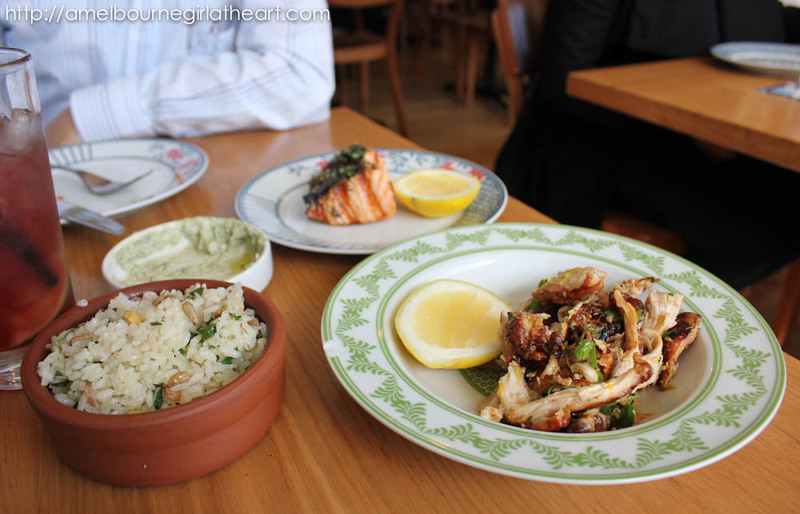 My mum had recently had the Express Lunch option at St Katherine’s with her work mates and loved it and since my mum is not much of the foodie, I knew I had to pay attention. Parking is a bit tricky along Cotham Road so I’d strongly suggest that give yourself plenty of time to try the side streets for parking. Thankfully, we were early and had a space waiting for us to occupy (blessing from Heaven!) so we pushed on passed the heavy doorway exactly on time for our 12pm booking. We were the first customers in the door but once we were ushered to our seats, it was only in a matter of minutes that the place started to pack out! For those who aren’t aware, an “Express Lunch” is a 2 course set that gives you a quick taste of what St Kat’s has to offer. It changes from day to day (or perhaps week to week… not sure) so you just get whatever the cook cooks :). 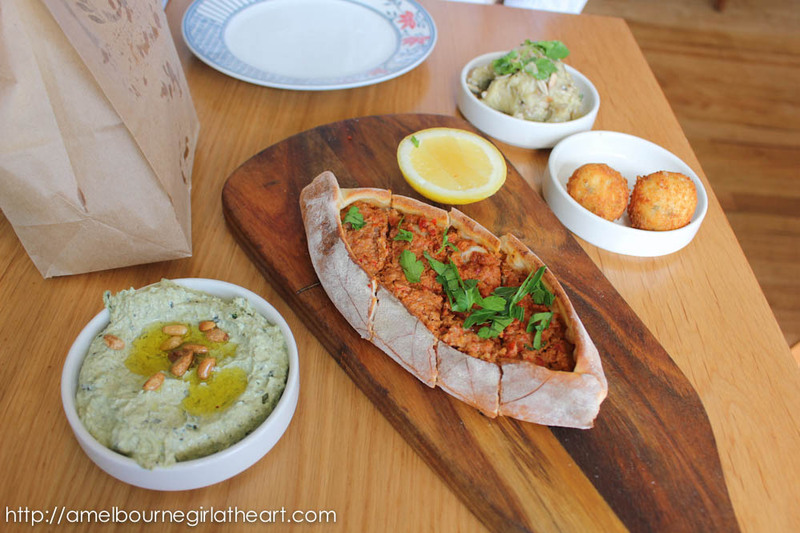 That day, for starters we had a spinach cheese dip, smoked eggplant salad, lamb pide and haloumi deep fried balls (lol can’t remember the exact name! – anyone know?) with a bag of toasted Turkish bread. The lamb pide was alright – a bit spicy but nothing that flash I’m afraid. I did enjoy the smokey flavour of the eggplant and I like eggplant in general so that was a winner for me. 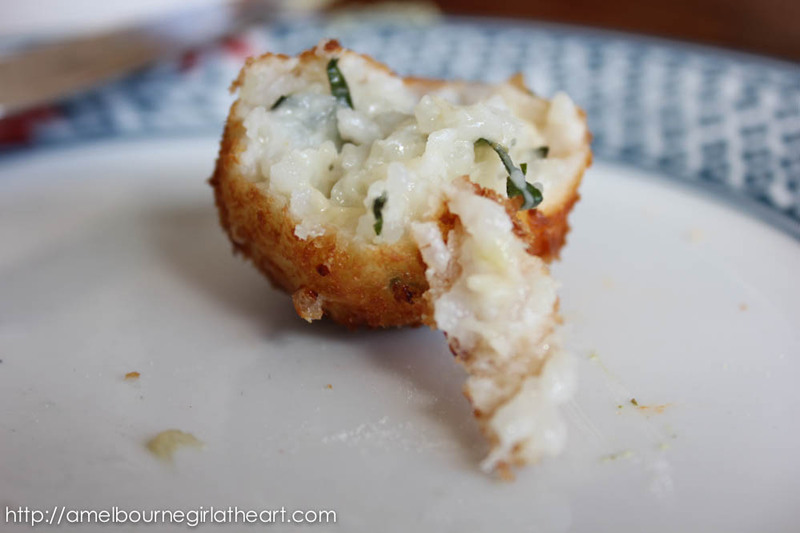 Yup, I LOVED THESE BALLS :D Well, I only had the one but I loved the texture of it and the saltiness of the cheese mixed with the rice and herbs… yum! 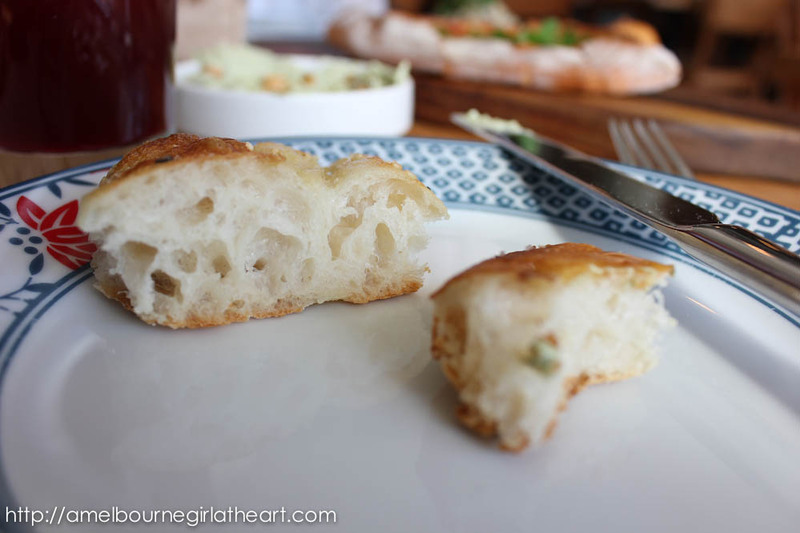 The Turkish bread was also a favourite of mine! I don’t think I’ve ever had such good Turkish bread before! It was lightly sprinkled with salt and brushed with butter I think and because it was kept warm in the paper bag, it was just a delight to spread with the spinach cheese dip :). 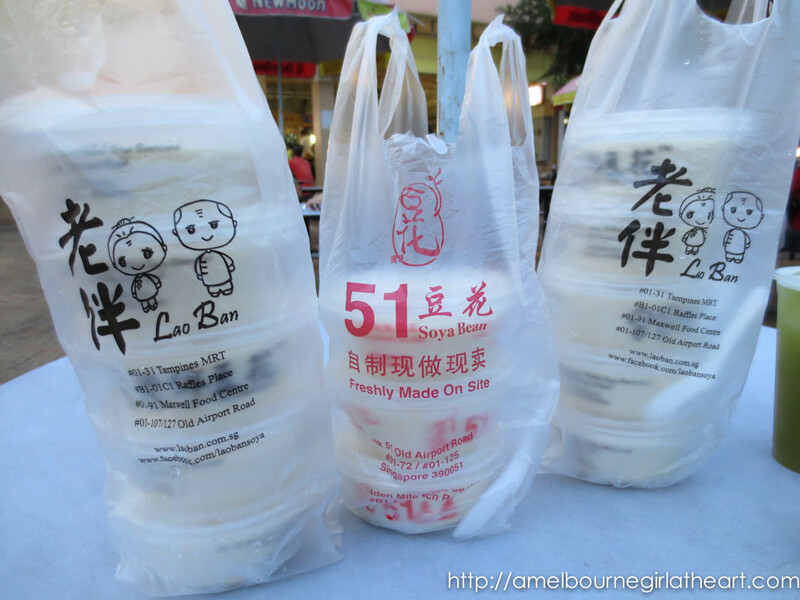 So good that we asked for another bag later in the meal to munch on hehe. At first, my dad who is used to Asian dishes piled up with food was like, “This is it?” Haha, but though it looks kind of small portion-wise, it was very filling and we were quite satisfied by the end of this course (the extra bag of Turkish bread probably helped!). 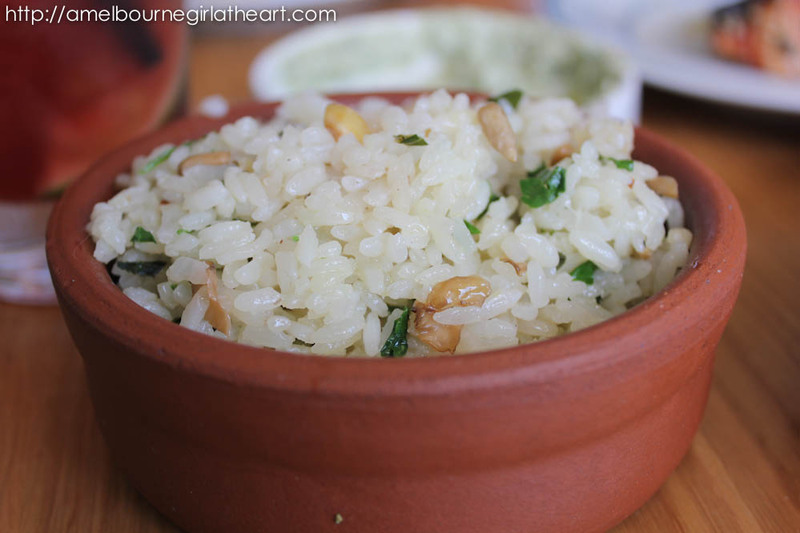 First up, I tried the rice pilaf with mushrooms, tarragon and hazelnuts. Was very light and with enough flavour that you could eat it on its own, but it wasn’t so overpowering so that it was also a nice accompaniment for the other two dishes. 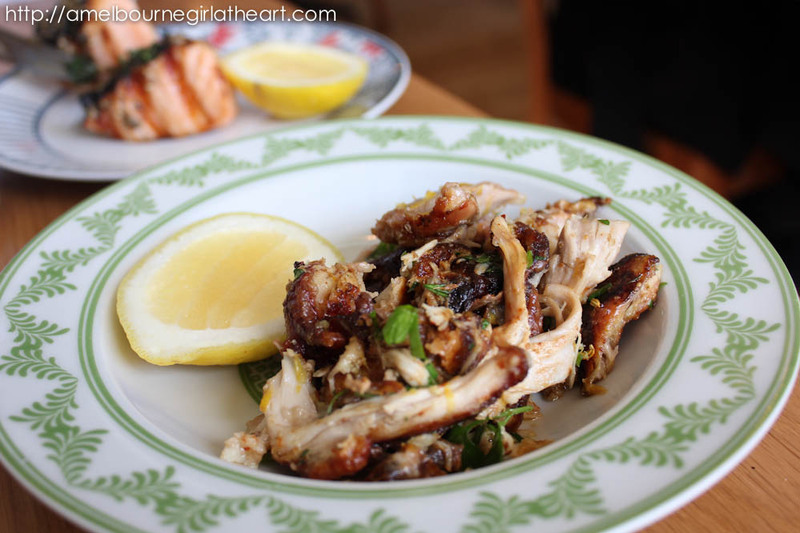 Next was the grilled chicken carved out from the rotisserie that was dressed with yoghurt (I believe… I really should have taken notes!) which I quite enjoyed as well. Nice with the squeeze of lemon :). 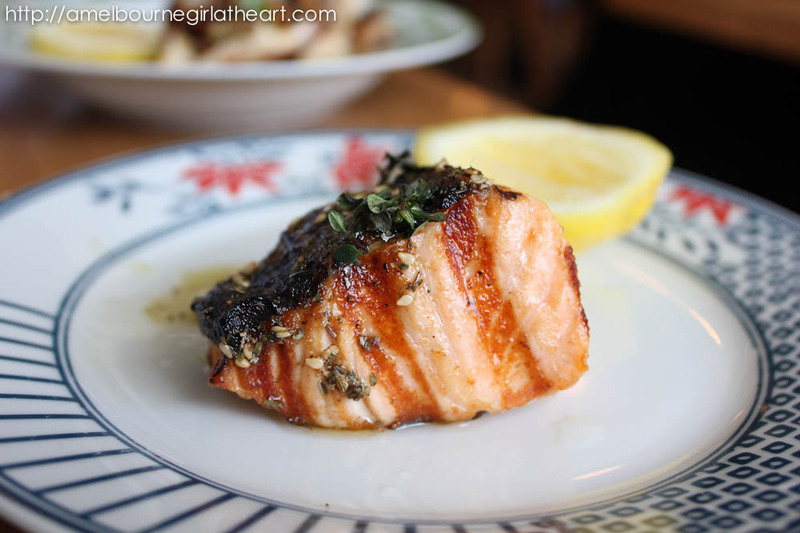 The salmon was cooked perfectly and the skin was crispy. Couldn’t fault it. Loved it :). Overall, a lovely dining experience. 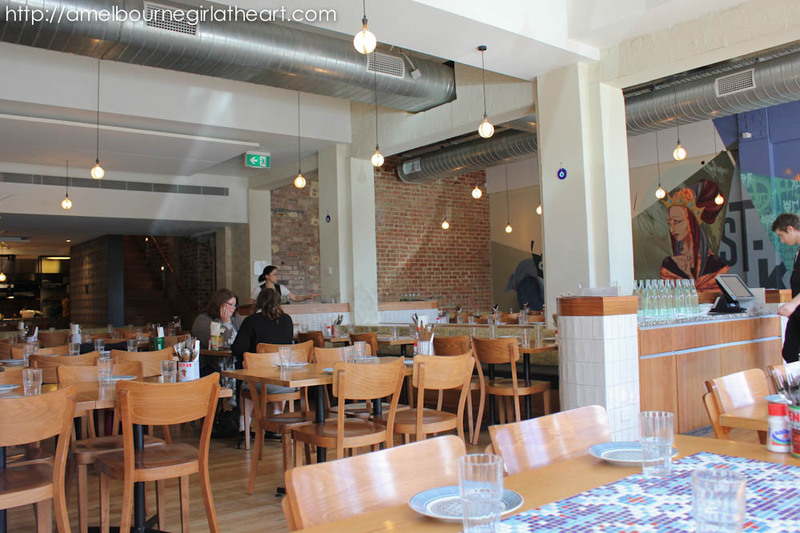 The staff were very attentive and professional (as you would expect from a George Calombaris and Shane Delia restaurant. 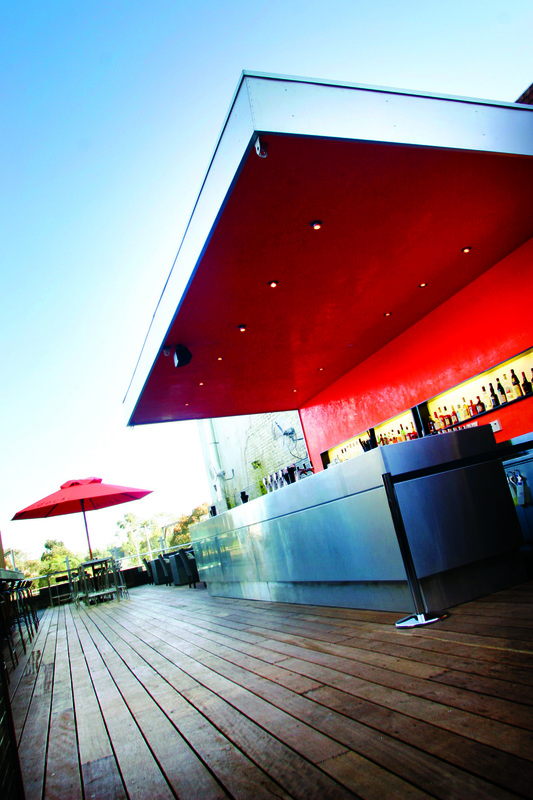 Bookings are a must to avoid disappointment during the lunch hour as it fills out very, very quickly! 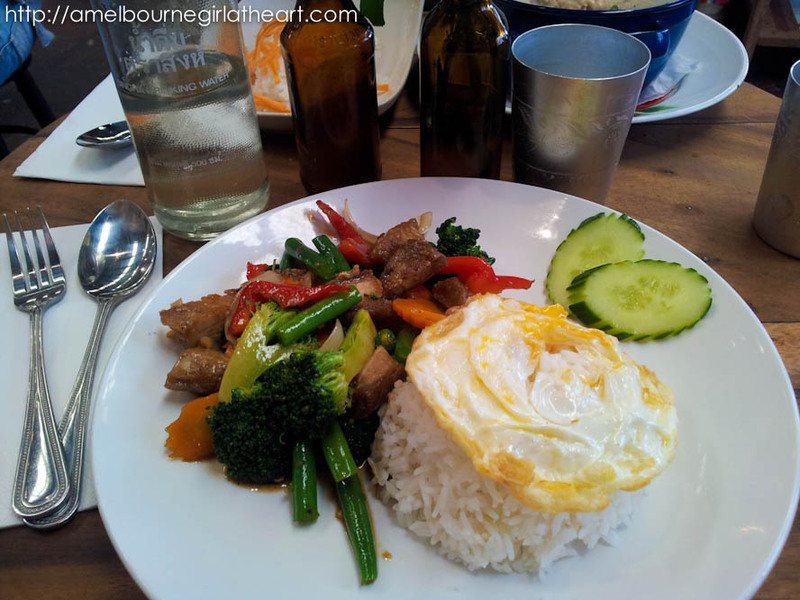 And for $19.50 per head, the Express Lunch is well worth the visit! More importantly, I got to spend the lunch with my mentor, my coach, my friend, my godly counsel, my fellow foodie, my dad :). Question time: What’s a fond memory that you have of your father/grandfather/father figure?